I had a wonderful time being home from Nov 4-Dec 13! I have been to almost every store here and anywhere i traveled, have 3 full suitcases to go with and am glad to be going home to warmer temperatures. They had a record breaking 3 day cold of 24 (-5 C) F while I was here--that was one record I didn't care to be part of! I have had lunch and dinner with so many friends and family--I am sure i gained weight! Thanks you for all I got to see and catch up with and sorry I missed some of you. 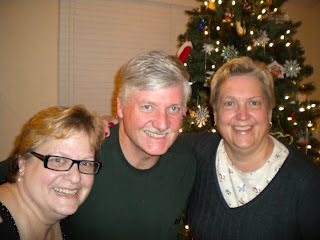 Kim, Dennis and Kathy--2 of my 4 siblings! I celebrated Christmas with my family all day yesterday. We started the day with 3 of us girls having manicure and pedicures and ate crab sandwiches and crab Louies! We ended by playing Triominos and Attach Uno--what fun! I am carrying back money to buy 75 matresses so far--thank you for all who helped! I'll be in touch after I am back! Merry Christmas to all and may 2010 be a better year for you and the Lord! Sorry to have been off for a couple of weeks but have been having some medical issues. After months of chronic UTIs I went for an IVP which was normal, no stones and within 12 hours started pain and passed a stone! So much for tests! I had Major drive me to Harare to see my doctor because of the excruciating pain and about at the end of our dirt road felt a lot of pain and then relief! I knew that bumpy road was worth something! All the way on the road I was curled up in fetal position not talking and Major was sure I died and kept asking if I was OK! I couldn't talk because it would hurt more and so he talked more! Funny now that I look back at it, not when I was using my Lamaze breathing techniques! That pain was something else and the drugs didn't touch it--and let me tell you I tried quite a few! 10. You ask someone’s name to write in the Lab test book and he says “I’m Innocent” and you reply “I don’t care if you are innocent or guilty, I just want your name” and then you figure out that is his name—Innocent! 9. Your order an X-ray and when the patient asks how much it is you reply “8 chickens or 1 goat, if it big or 2 if it is small, or 10 Obama dollars, 100 Zuma Rands, 1 blanket or 6 litres of cooking oil. 8. You ask for warm water for a surgical procedure and they call the driver and car and when you ask why they said you asked for “wamotor” (Shona for car). 7. You ask a nurse why this order was not done in the last 24 hours and the answer is “I did not admit the patient” so if the order was not followed it is the fault of the nurse who admitted the patient! This week we reviewed our barter prices and thought you might enjoy this. Maybe I can be an advisor for Obama on his health care agenda? Well it got to 105 today! We were in the pool after lunch to cool off! the water temp was only 80 and so it felt cold to me! this week has been very busy. I have added 104 new patients on ART this month and it is not over yet! We could add a 1000 more a month if we had the staff and time! People say AIDS is improving and there are less new cases, but we haven't seen that! Lori arrived last night and she is happy to be back and I put her to work today! The doctors are away today for their continuation education day so it was the nurses in charge day! Last night Dr. Murenje called me to deliver a footling breech. I was able get both feet down and then the hands and finally the head--the baby and mom did well. My heart always races until that head is out! It weighed almost 8 pounds. It was her second baby! Well this is the end of a busy week. Major and Dr. Zimudzi went off to South Africa to pick up Lori, a nurse who is joining our work for at least the next 2 years! She arrives in Joberg on Tuesday morning. My visitor, Charolette is being dropped off in Bulawayo this evening to spend a few days with friends while the guys go on to SA. she was born and grew up in Bulawayo so she is going home! This week it is getting up to the 90's during the days and high 60's at night--so it seems winter is almost over. It has been a busy week at the hospital. We had 3 outreach clinics in the last week and over 800 patients now on ART! One area that we go to the people are very disappointed if we test them for HIV and they are negative. Their is a foo organization giving food to those with HIV--so they want the food! This leads us to believe some people are seeking HIV in order to get food! Maybe food should be given to all the people who need it. My visitors bag finally arrive 5 ays after she did! She was very happy to have new clothes to wear! Lori will be here in 1 week an we look forward to that. Still have 4 visitors here with me this week: Jimmy, Tej, Mark and Bre. Keeping them busy with lots of work at the hospital. Seems like electricity is a big problem these days. Writing this by candlelight--wildfires around us (common this time of year) continue to burn electricity poles down. Major is in Swaziland this week with Rick and Sue Hahn and Jordan Smetzer who have been visiting us. They went to investigate an orphanage their church supports there. Stay tuned for more exciting news from Chidamoyo, Zimbabwe.